Lively and upbeat, this collection from Mario Alberto Pérez offers faith-based music for anyone who enjoys the tejano style of music from northern Mexico. 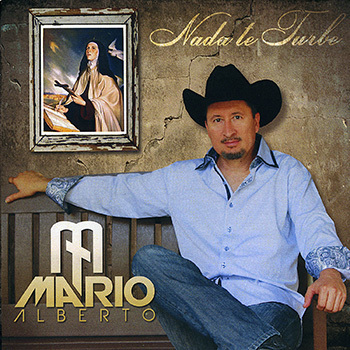 This album from Mario Alberto Pérez contains 10 songs in the tejano style of Northern Mexico. This MP3 album from Mario Alberto Pérez contains 10 songs in the tejano style of Northern Mexico. Where we're from will always be an important part of who we are. For Mario Alberto Pérez, the music on this collection of norteño music is a way to honor his cultural origins in Delicias, Chihuahua in northern Mexico where he grew up. This fun, lively tejano style of music will be familiar to many—Hispanics and non-Hispanics alike. Offering a varied and colorful mix of musical styles, Nada Te Turbe contains traditional rhythms from the northern region of Mexico such as tex-mex, balada norteña, huapango norteño and bolero norteño. Hoping to provide an authentic sound, recording of the songs took place in Chihuahua, and the use of typical instruments of this genre of music, especially accordion, bass guitar and drums, also adds to its authenticity. Though not music for liturgy, these songs are great for prayer groups, special events, retreats and even a simple get-together with friends or family. More than anything, this music is for the Hispanic community that responds to this style of music. It's a way for all Hispanics to know and recognize that God speaks in their language too, even through the music of northern Mexico.